Democracy- Iran style. For an interesting analysis of the recent Iranian elections check out the Head Heeb. The author Jonathan Edelman cautions against seeing the result as a victory for the reformers, despite their gains. Instead it should be seen as a victory for Supreme Leader Ayatollah Ali Khamenei who managed to stop President Mahmoud Ahmedinejad and his spiritual mentor Ayatollah Mohammed Taghi Mesbah-Yazdi from taking control of the Assembly of Experts, which would have allowed them to replace Khamenei and concentrate power in the hands of the President. His tactics? Simple: just use the Guardian Council to block two-thirds of candidates - particularly those who were pro-Ahmedinejad. "What a sorrow has fallen the Turkmen people": President Saparmurat Niyazov of Turkmenistan has died of heart failure. The colourful but oppressive Niyazov was known for spending his country's considerable energy wealth on grand schemes such as a huge, man-made lake in the Kara Kum desert, a vast cypress forest to change the desert climate, and an ice palace outside the capital. He gave himself the title of Turkmenbashi "Great Leader of all Turkmen." He ordered the months and days of the week named after himself and his family, and had statues of himself erected throughout the nation. He even built a statue of himself on top of the capital's neutrality arch which rotates 360 degrees so that it is always facing the sun. Modestly, he said “I'm personally against seeing my pictures and statues in the streets - but it's what the people want.” Children pledged allegiance to him every morning in schools before studying from books he had written. His writings were also required reading for driving tests and for all adults on Saturdays. The BBC is leading this morning with the ridiculous Chatham House paper on Blair's Foreign Policy record. Who are these people? The author of the document (all five-and-a-half pages of it) is Professor Victor Bulmer-Thomas, who had a background in Latin American politics before taking over at the RIIA (Chatham House). "Tony Blair's successor(s) will not be able to offer unconditional support for US initiatives in foreign policy and a rebalancing of the UK's foreign policy between the US and Europe will have to take place." And that's as detailed as the argument gets - basically an assertion of the random political preferences of Prof. Bulmer-Thomas. Margaret Beckett has hit the nail on the head with her response: "This paper is threadbare, insubstantial and just plain wrong. Chatham House has established a great reputation over the years, but this paper will do nothing to enhance it." So why does this ludicrous piece of junk get on the top of the news? It coincides exactly with the BBC world-view: Blair's a poodle, Bush is an ape, we should bin the yanks and "get deeper into Europe" in some unspecified way. Quite apart from the headline message, the paper is a frustrating read. For example there is a throwaway line about how "The emphasis on aid and debt relief for Africa in return for an improvement in governance may come to look strangely old-fashioned." What does this mean? We are not told. The sniffy tone doesn't help either: "Tony Blair has learnt the hard way that loyalty in international politics counts for very little." That sort of stuff obviously does it for the BBC in a big way, but it doesn't leave any of us any the wiser about how the RIIA think we should run our foreign policy. What US governments want is a European Union that can make a real contribution to the international political and security agenda, and any European government with the diplomatic skills to deliver EU support will be hugely appreciated. Britain has an opportunity to play that role provided it is taken seriously by its European partners and contributes fully to the European project. In due course, that will require the United Kingdom to revisit its opposition to joining both the Schengen agreement and the Eurozone. So the solution for our problems in Iraq, Afghanistan, Iran etc is... for Britain to join the euro? These people have lost their minds. The US would certainly like European countries to pull their finger out, deploy troops in the dangerous parts of Afghanistan, and relax the rule-of-engagement / human rights law constraints on what they can do. The US would like European countries to spend more on defence. They would probably like more diplomatic support too. The problem is that for several countries European defence is about finding a way to spend even less on defence. Its about pointlessly confronting the US diplomatically, and it weakens the international structure (NATO) which allows meaningful transatlantic cooperation. Instead the EU offers the prospect of endless meetings, and press-release diplomacy. Somebody once said that the EU was a like a retirement home for former world powers. In that sense the EU and RIIA suit each other well. According to the Sunday Telegraph many Romanians are already getting fed up with the EU and its attempts to ban local traditions such as sheep-stomach wrapped cheeses, leaving corpses at home for three days after death, and under-aged marriages in the Roma community. They also want the Romanians to start packaging veg before it is sold from farms, begin taxing home made plum brandy and start killing animals in a more humane manner in front of an inspector. "I thought when we joined the EU we'd get lots of benefits and freedom. But what does freedom mean if I can't slaughter my own pig in my back yard?" The Open Europe team has had all hands on deck this week stuffing envelopes with our new report on EU financial regulation which we're sending out to as many people as we can afford. When the posties came to pick up the mail bags filled with the reports they shook their heads in that familiar plumber-style fashion: "Sorry pal, won't be able to take them." "Too heavy... It's these bloody European directives. Can't carry anything over 11 kilo..."
To be fair though, we're not experts in EU postal directives so we can't immediately check that this isn't just another "euromyth". We're going to look into it and will update you at a later date. If any readers can clear this matter up for us we'd we'd love to know, or if you've got any EU regulation stories that you want to share / get us to chase up stick them in the comments. Former Europe Minister Denis McShane has a letter in today’s FT, in response to an article by Malcolm Rifkind in the paper on Wednesday. …Sounds like a reheat of his previous mildly hysterical claim that "Euroscepticism is a misnomer. What we are actually taking about is hatred of Europe and a sense of superiority… I'm afraid we have got a dark streak of xenophobia and racism in our mentality. Anti-Europeanism allows it to get a lot closer to the surface”. Jose Sequeira, the Commission bureaucrat marched from his office two years ago after the Commission's own medical service said he was mentally unfit to work has been vindicated by an employment tribunal in Luxembourg, with the original decision against him overturned. This story originally came to light in the FT back in September. Sequeira had raised allegations of corruption in the Jacques Santer-led Commission during the late 1990s. He was then accused of circulating a “defamatory dossier” by his superiors (the dossier was never produced), before being branded mentally unstable by a Commission-contracted psychiatrist. He was then placed on “indefinite sick leave” as a result. Three different doctors have since given him a clean bill of health. Such cases of mental illness are curiously prevalent in Brussels. Out of the 200 Commission staff members placed on long term sick leave each year, half are prescribed as having mental illness, at a cost to EU taxpayers €74m a year. Marta Andreassen, who was sacked by then-Commissioner Neil Kinnock in 2004 for blowing the whistle on its financial incompetence, claimed earlier this week that before her departure she had received internal emails which warned, "We have ways of breaking people like you.” Perhaps sometimes, but not in Mr Sequeira's case. This story literally gets more extraordinary by the day. As Dan Hannan wrote a couple of months ago, "It’s hard to avoid the suspicion that the two events are linked. One day, Günter Verheugen, the Commission Vice-President, attacks the cost of Euro-bureaucracy. The next, photographs appear of the Commissioner strolling hand in hand with a female aide while on a visit to Lithuania." For those of you who haven't been following the story - a quick recap. Back in October Verheugen told the Sueddeutsche Zeitung that there was a "permanent power struggle" going on between EU Commissioners and their top civil servants. He said that the civil servants had "too much power" and that he had "strongly criticised" some of them for thwarting his deregulation drive. He then upped the stakes further by telling the FT that this failure to deregulate is costing the EU economy €600 billion a year. That weekend pictures of Verheugen and his chief of staff Petra Erler holding hands on a trip to Lithuania were published in the German press. The following week FT Deutschland reported that EU officials were openly calling for Verheugen to resign over his attack on Commission staff and his reported favouritism in recently promoting Erler - a relative Commission outsider. Then just last Friday the whole thing got nastier. The Times reported that German weekly Focus was threatening to publish pictures of Verheugen wearing just a baseball cap - on a nudist beach with Erler. Even though the pictures haven't yet been published they have caused quite a stink in Germany where many are calling for Verheugen to resign. One MEP, Herbert Reul said, "It’s unacceptable that an EU Commissioner should be running around naked on a beach with a senior female colleague”. The powers that be in both Berlin and Brussels have publicly given Verheugen their support -maintaining that this is a private matter. It is unlikely that either he or Erler will be forced out: Verheugen is too important a member of the Social Democrats to be touched while there is a weak governning coalition. Indeed, Erler used to employ a certain Angela Merkel as her spokeswoman when she was in the Eastern German government. “Mr Verheugen’s difficulties were predicted last month by the Commission's former chief accountant, Marta Andreassen, who was sacked by then-Commissioner Neil Kinnock in 2004 for blowing the whistle on its financial incompetence... She claimed that Mr. Verheugen was being dragged through the mud because of his complaint that "too much is decided by [EU] civil servants on spending in a non-accountable way. Ms Andreassen says that she received internal emails which warned, "We have ways of breaking people like you." Charlie McCreevy, the Internal Market Commissioner, has a comment piece in today’s FT on EU financial services regulation, disputing the arguments of our recent study, and a leader in the FT that followed its release. 2) McC: “MiFID is a pro-competitive strategic change of direction”. It’s certainly a change of direction, but whether it will be pro-competition, or even of net benefit is still a highly contentious point. Smaller firms don’t see it in McCreevy’s terms – many fear that it is so onerous that it will drive them out of certain business lines, leaving the larger banks – who can absorb the large compliance costs – to mop up. Industry in general is still lukewarm over the supposed opportunities of MiFID. A survey conducted for the FSA said that “firms are particularly sceptical about the likelihood of benefits arising from MiFID, and generally take the view that the costs of MiFID pose greater challenges than the benefits provide opportunities." 3) McC: “Europe’s share of business rose relative to the US between 2001 and 2005”. This is incredibly complacent. Yes - London has succeeded in prising business away from New York. But the reason for this is not so much an enlightened approach from Brussels as a short-sighted, complacent stance from US regulators in pushing through the Sarbanes Oxley Act, which has unquestionably caused business to migrate offshore. Many of the most important FSAP measures have not yet begun to “bite” – MiFID doesn’t come into force until late 2007 – so it’s probably premature for McCreevy to say that the EU is safe from a similar flight of business. In fact, many of the more mobile companies are considering off-shoring already. Complacency was the undoing of regulators in the US in drafting Sarbox. The Commission could easily fall into the same trap with the Financial Services Action Plan. Mixed messages from the Cameron trip to Brussels. "The Common Agricultural Policy is an economic and humanitarian disaster which pushes up food prices for the poorest in Europe and helps lock the developing world into poverty. And the EU still has higher trade barriers against poor countries than it does against rich." "If a company director failed to sign off accounts for 11 years, they would probably be heading for jail,"
"We are a new generation. We have no time for the culture of hopelessness that has plagued the way the EU has often attempted to address the big global challenges we face." All sounds like part of the new "gritty agenda". “Everybody keeps going on about how disconnected Europe is. Let’s get the Doha trade round started, trade justice is what will connect the EU with voters – rather than the EU picking the fluff out of its own navel,” he said. Describing institutional reform as “the boring bit” of European affairs, Cameron said his conviction that Brussels can secure change without a constitution has the backing of many in the European commission. “Commissioner Dimas was very optimistic that emissions trading can be made to work under the current set up,” he insisted. Daisy has more pictures (mostly of Nick Watt's head). Tory home have condensed it into four issues: global poverty, climate change, fighting fraud and economic competitiveness. They write that: "They neatly combine Euroscepticism with modernising messages on the environment and poverty." Basically in some ways they are on the right track - definitely in terms of picking the "right fights to have". The question is whether/how they now refine it into a clear set of detailed goals and campaigns. It's not 100% clear which way they are going to go yet. If the tories bought into the Commission & FCO's repositioning line that "the Commission has changed and are now on Britain's side" they would be in real trouble. The bottom line is that despite Barosso talking a good game on deregulation and free trade, the EU regulatory burden is still going up and up; and on trade the EU is the biggest obstacle to a pro-development Doha round. It seems like Cameron is not inclined to believe the hype on those issues. On the environment things are a bit more mixed. Quite a lot of tories really want to back the ETS because it's green and will make them look softer on Europe. The only snag is that its an expensive failure, and doesn't reduce emissions (as sources as diverse as the Carbon Trust, the FT, the Environment Agency, and the Economist have now pointed out). Anyway - it's good that they are re-engaging with the issue a bit. But they have a long way to go. Given that the Constitution (sadly) isn't dead - and is in fact coming back in March next year - they don't have long to turn around the way they deal with the issue. The Treasury have released figs on how much the ECJ ruling on Controlled Foreign Companies is going to cost them. Its easy to find... if you happen to be looking through the footnotes to table 4B, on page 240, Annex B.
PBR also contains further evidence of how hard the Treasury finds it to predict how much we are going to be paying into the EU: Spending for this year, for instance, has gone up from £600m to £2,800 m since the Budget a couple of months ago. Its a bit of a mess. 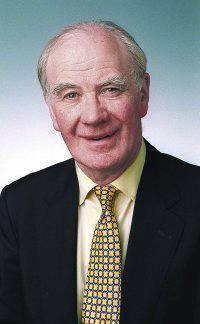 Liberal Democrat leader Menzies Campbell is to make his first "big" speech on Europe next tuesday morning. Apparently there is going to be some stuff about distancing ourselves from the US, some stuff about having missed an opportunity to lead in Europe by not joining the euro, and some vague stuff about the need for the EU to be a bit less bureaucratic. ... the whole thing sounds a bit like it fell through a time tunnel from 1997. Which is a real shame because MC is certainly not thick, and is supposed to have a comparitive advantage on foreign affairs. It will be a bit depressing for Lib Dem MPs too - many of whom have moved away from the starry-eyed nothing-that-comes-from-Brussels-can-be-bad mentality. It certainly isn't what Lib Dem voters believe. Last time they were asked about the euro (Dec 04) they were 57-43 against joining. Your MEP: hot or not? People say that curiosity killed the cat. It's certainly capable of absorbing an incredible amount of research time. We wanted to know which MEPs were most effective in gaining publicity. So we've done a quick back-of-the-envelope ranking based on how many times they have appeared in the press over the last 6 months (as measured by the Lexis Nexis database) and how many hits they turn up on Google. We're certainly not claiming it's an exact science, and it's definitely not a measure of whether someone is a "good" MEP. There are probably all kinds of problems with the data, which I'm sure you will let us know about. But anyway, with all that borne in mind it's still quite an interesting ranking. There seems to be a big publicity gap between the best and the worst performing MEPs. Top of the Pops are recently reinstated Tory Roger Helmer and anti-euro Green MEP Caroline Lucas. The Lib Dems seem to dominate the rest of the top of the chart, with the exception of Labour's Richard Corbett. Return of the 'potato wars'? Mischievous German newspaper die Tageszeitung yesterday tried its best to instigate a repeat of this summer's "potato wars" between Berlin and Warsaw. 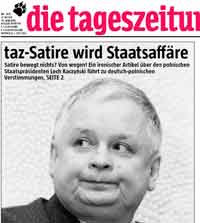 In July the paper described the Polish President Lech Kaczynski as Poland's "new potato" on the eve of a Berlin summit between Germany, Poland and France. Kaczynski urged Merkel's government to demand an apology, when they refused, he cancelled the summit, claiming that he had a stomach bug. The summit was rearranged for today and TAZ decided to finally "welcome" the Polish President by printing two pictures of him next to potatoes on its front page below the headline: "Which one of you is it that's coming again?" 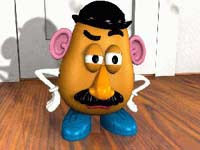 According to Reuters "to liken someone to a potato is seen in Polish culture as rather like calling them a peasant." Ouch. The whole thing is a symptom of a wider tension between the two countries involving everything from the baltic pipeline between Germany and Russia (which goes around Poland) to feelings of a lack of gratitude on the German side - where they feel like they did more than their fair share to aid Poland after the fall of the wall, and to help it join the EU. probably overwhelming majority against (giving up the veto). That's our view. Great news. Although I'm not so sure the Commission would agree. One only needs to read an interview from last week with Jonathan Faull, Director-General of the EU Commission's justice department, by the Commons Home Affairs committee (who we gave evidence to a couple of weeks ago). will not hear any more about the passerelle proposal? Chairman: When do you expect us to hear about it next? Mr Faull: ... By next summer we may have a better view of where the Union is going more generally, and then it may or may not be necessary to come back to the bridging clause issue. Faull says that Europol might soon take on a more hands-on policing approach - something the UK is trying to resist. "Europol is designed to co-ordinate, and perhaps one day actually to run, investigations itself in a way which Interpol is not designed to do at all”. The Austrian Presidency also recently mooted giving Europol a greater role in national investigations. Watch this space. He calls for an EU wide migration policy, so that the EU Commission can barter with non-EU countries over how many of their citizens the EU as a whole should let in each year. Faull shows just how native he has gone: "among nearly all Europeans, not you [the UK] and not Ireland, of course, the borders have disappeared internally"
The sectarian fighting in Iraq is at its worst level since the invasion in 2003. Kofi Annan has described it as "much worse" than a civil war. Fighting in Sudan is spilling over into its neighbouring countries and the French airforce has been bombing rebels in the Central African Republic. The political crisis in Lebanon looks increasingly precarious. There has also been some trouble in the South Pacific. Australia and New Zealand had to send in troops to quell the rioting in Tonga and it looks like Fiji might be heading towards its fourth coup in 20 years. Our work on the Financial Services Action Plan is out. Its on the top half of P4 of the FT (here and here). Richard North doesn't like it (surprise surprise). A measure of how much the EU cares about the City? Take the MiFID directive - just one of 42 meaures intended to create "a single market in financial services". It's going to cost the UK about £6 billion or so by 2010. The original idea sounded good - let banks compete more with stock exchanges. Problem: various member states didn't want their tiny bourses to get eaten up by gigantic (London based) banks. So they start presssing for loads and loads of onerous pre-trade trasparency rules to stop all but the most enormous banks getting involved. Gordon Brown has to take the afternoon off for the birth of his son (fair play considering circumstances). Paul Boateng turns up, asks for a delay. Instead the Italians force an (unprecendented) snap vote to add in the red tape. Then to add insult to injury they pass the final directive by rubber stamping it in the fisheries council. No wonder people in the City are being driven nuts by all this stuff. Richard North reports that Chris Booker on the Sunday Telegraph had his column cut after he penned a piece critical of David Cameron. Regardless of what you think of the piece or the argument - that's a pretty serious thing. 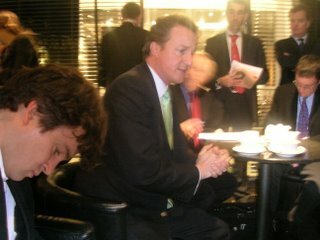 I was told by the SunTel editor today that my item attacking Cameron is to be dropped. This is the first time such a thing has happened since I began writing the column 16 years ago. Ludicrous titles for academic papers are a great source of fun at 2AM when you are trying to research mindbendingly complicated trade policy issues.